Governor Tamaki’s First Visit to the U.S. Governor Denny Tamaki carried out his first official visit to the United States from November 11th to November 14th, 2018 (November 11th to 12th in New York, and November 13th to 14th in Washington D.C.). On November 11th, the Okinawa Prefectural Government held a talk by the Governor of Okinawa at New York University entitled: “The Power of Diversity and the Pride of Democracy in Okinawa” with 140 people in attendance including Okinawan people living in the U.S, military veterans, and people from the media. 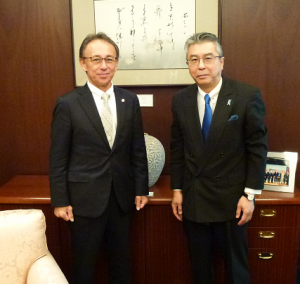 In his speech, Governor Tamaki conveyed his hopes that the citizens of both Japan and the United States see the current situation in Okinawa as their own issue as well by not holding Okinawa solely accountable for finding a solution, and question themselves as to why only Okinawa must bear the excessive burden of the U.S-Japan Security Arrangements. 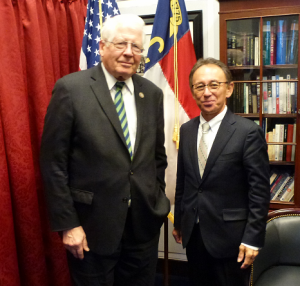 He also expressed his wishes that they share with each other consciousness regarding the issues in Okinawa and further expand solidarity of action for Okinawa beyond the pacific. Assistant Professor Annmaria Shimabuku at New York University served as moderator for the talk. In the question and answer session with the audience, there were many questions and active discussions on various topics, including what measures have been taken by the Japanese Government to alleviate the burden on Okinawa and how Okinawa will proceed with holding dialogues with the Japanese Government. Governor Tamaki was received by Ms. Izumi Nakamitsu, Under Secretary General of the United Nations, Dr. Michal E. O’hanlon, Senior Fellow of Brookings, Dr. Sheila Smith, Senior Fellow for Japan Studies in Council on Foreign Relations, and Dr. Mike M. Mochizuki of George Washington University. 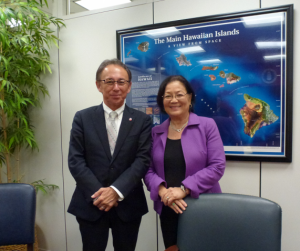 He also met with officials from the U.S State Department, Department of Defense, and Congressional Research Service, as well as Mr. Shinsuke Sugiyama, Ambassador of Japan to the United States of America, Senator Mazie E. Hirono (D-HI), and Representative David E. Price (D-NC). Additionally, Governor Tamaki had an opportunity to attend receptions held by the Okinawa American Association of New York and the Okinawa Kai of Washington D.C.